The research in the Hormiga laboratory focuses on the systematics and evolutionary biology of spiders, with emphasis on orbweavers and their close relatives (Orbiculariae). We use morphological, molecular and behavioral characters to reconstruct the phylogenetic relationships of our study groups. We tackle questions that span from species level taxonomic problems, addressed using a monographic approach, to intra and interfamilial phylogenetic relationships. We have an active fieldwork program that has taken us around the world in search of our study organisms. Our most recent fieldwork has been carried out in several countries of the Neotropical region, Madagascar and Equatorial Africa, Australia and New Zealand. We also use comparative phylogenetic methods to study more general questions such as the evolution and diversification of web architecture, the evolution of sexual size dimorphism or the patterns of insular diversification and colonization in oceanic archipelagos. Benavides, L.R., Hormiga, G. & Giribet, G. In press. Phylogeny, evolution and systematic revision of the mite-harvestmen family Neogoveidae (Opiliones, Cyphophthalmi). 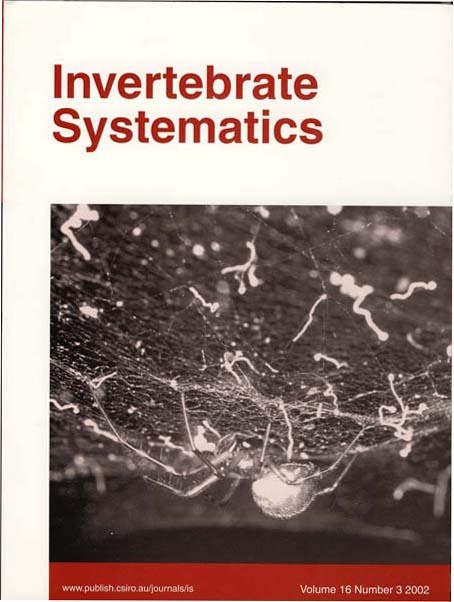 Invertebrate Systematics. Kallal, R.J., Fernández, R., Giribet, G. and Hormiga, G., 2018. A phylotranscriptomic backbone of the orb-weaving spider family Araneidae (Arachnida, Araneae) supported by multiple methodological approaches. Molecular phylogenetics and evolution. 126: 129-140. Kallal, R.J. and Hormiga, G., 2018. An expanded molecular phylogeny of metaine spiders (Araneae, Tetragnathidae) with description of new taxa from Taiwan and the Philippines. Invertebrate Systematics, 32(2): 400-422. Huang, D., Hormiga, G., Cai, C., Su, Y., Yin, Z., Xia, F. and Giribet, G. 2018. Origin of spiders and their spinning organs illuminated by mid-Cretaceous amber fossils. Nature Ecology & Evolution, 2(4):623. Ballesteros, J.A. and Hormiga, G. 2018. Species delimitation of the North American orchard-spider Leucauge venusta (Walckenaer, 1841)(Araneae, Tetragnathidae). Molecular phylogenetics and evolution, 121: 183-197. Hormiga, G. and Dimitrov, D. 2017. The discovery of the spider genus Putaoa (Araneae, Pimoidae) in Taiwan with the description of a new species, including its web architecture. Zootaxa, 4341(1): 97-104. Hormiga, G. 2017. The discovery of the orb-weaving spider genus Pinkfloydia (Araneae, Tetragnathidae) in eastern Australia with description of a new species from New South Wales and comments on the phylogeny of Nanometinae. Zootaxa, 4311(4): 480-490. Benavides, L. R., Giribet, G., and Hormiga, G. 2017. Molecular phylogenetic analysis of pirate spiders (Araneae, Mimetidae) with the first description of maternal care behavior in the family and the description of a new African genus. 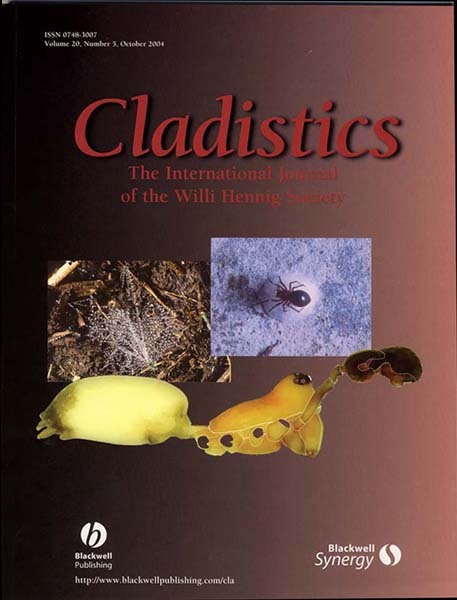 Cladistics 33.4 (2017): 375-405. Mammola, S., Hormiga, G. and Isaia, M. 2017. Species conservation profile of the stenoendemic cave spider Pimoa delphinica (Araneae, Pimoidae) from the Varaita valley (NW-Italy). Biodiversity Data Journal, 5, p.e11509. Hormiga, G. and S. Lew. 2017. Pimoidae. In: Darrell Ubick, Pierre Paquin, & Paula E. Cushing, (eds.) Spiders of North America: an identification manual. Levi, H.W. and G. Hormiga. 2017. Tetragnathidae. In: Darrell Ubick, Pierre Paquin, & Paula E. Cushing, (eds.) Spiders of North America: an identification manual. Giribet, G. And G. Hormiga. 2016. Chapter 24. Phylum Arthropoda: The Chelicerata. In: Brusca, R. (Ed.) The Invertebrates, 3rd Edition. Mammola S., Hormiga G., Arnedo M.A., and Isaia M. 2016. Unexpected diversity in the relictual European spiders of the genus Pimoa (Araneae, Pimoidae). Invertebrate Systematics 30(6): 566 587. Ballesteros-Chavez, J. and Hormiga, G.. 2016. A new orthology assessment method for phylogenomic data: Unrooted Phylogenetic Orthology. Mol. Bio. Evol. 33: 2117-2134. doi: 10.1093/molbev/msw069. Kallal, R.J and G. Hormiga. 2016. Redescription of the Jamaican orb-weaving spider Chrysometa pecki Levi, 1986 (Araneae, Tetragnathidae), including the first description of the male. Zootaxa 4066 (1): 95–100. Benavides, L. R. & G. Hormiga. 2016. Taxonomic revision of the Neotropical pirate spiders of the genus Gelanor Thorell, 1869 (Araneae, Mimetidae) with the description of five new species. Zootaxa 4064:1-72. Fernández, R., G. Hormiga and G. Giribet. 2014. Phylogenomic analysis of spiders reveals nonmonophyly of orb weavers. Current Biology 24(15): 1772-1777. Published online July 17, 2014. Hormiga, G. and J. Ballesteros Chávez. 2014. Chapter 26. Panarthropods: Arthropods and their closest relatives. In The Tree of Life (Edited by P. Vargas and R. Zardoya), pp. 305-314. Sinauer Associates. Hormiga, G. and S. Lew. 2014. A new American species of the spider genus Pimoa (Araneae, Pimoidae). Zootaxa 3827 (1): 95–100. Hormiga, G. and N. Scharff. 2014. The strange case of Laetesia raveni n. sp., a green linyphiid spider from Eastern Australia with a preference for thorny plants (Araneae, Linyphiidae). Zootaxa 3811 (1): 83–94. Hormiga, G. and J. Ballesteros Chavez. 2014. Chapter 26. Panarthropoda: Arthropods and their closest relatives. The Tree of Life, R. Zardoya and P. Vargas, Editors, pp. 305-314. Scharff, N. and G. Hormiga. 2013. On the Australian linyphiid spider Alaxchelicera ordinaria Butler, 1932 (Araneae). Zootaxa 3750 (2): 193–196. Hormiga, G. and C.E. Griswold. 2014. Systematics, Phylogeny and Evolution of Orb-weaving Spiders. Annual Review of Entomology 59: 487-512. Andriamalala, D. and G. Hormiga. 2013. Systematics of the goblin spider genusOpopaea (Araneae, Oonopidae) in Madagascar. Bulletin of the American Museum of Natural History 380: 1-156. Gavish-Regev, E., G. Hormiga and N. Scharff. 2013. Pedipalp sclerite homologies and phylogenetic placement of the spider genus Stemonyphantes (Linyphiidae, Araneae) and its implications for linyphiid phylogeny. Invertebrate Systematics27(1): 38-52. Murienne, J., Benavides, L. R., Prendini, L., Hormiga, G., Giribet, G. 2012. Forest refugia in Western and Central Africa as 'museums' of Mesozoic biodiversity. Biology Letters 9: 20120932. Scharff, N. and G. Hormiga. 2012. First evidence of aggressive chemical mimicry in the Malagasy orb weaving spider Exechocentrus lancearius (Arachnida: Araneae: Araneidae) and description of a second species. Insect Systematics & Evolution 70(2): 107-118. Dimitrov, D. and G. Hormiga. 2011. An extraordinary new genus of spiders from Western Australia with an expanded hypothesis on the phylogeny of Tetragnathidae (Araneae). Zoological Journal of the Linnean Society, 161: 735-768. Álvarez-Padilla, F. and G. Hormiga. 2011. Morphological and phylogenetic atlas of the orbweaving spider family Tetragnathidae (Araneae: Araneoidea). Zoological Journal of the Linnean Society 162(4): 713-880. Tu, L., and G. Hormiga. 2011. Phylogenetic analysis and revision of the linyphiid spider genus Solenysa (Araneae: Linyphiidae: Erigoninae). Zoological Journal of the Linnean Society 161, 484–530. Michalik, P. and G. Hormiga. 2010. 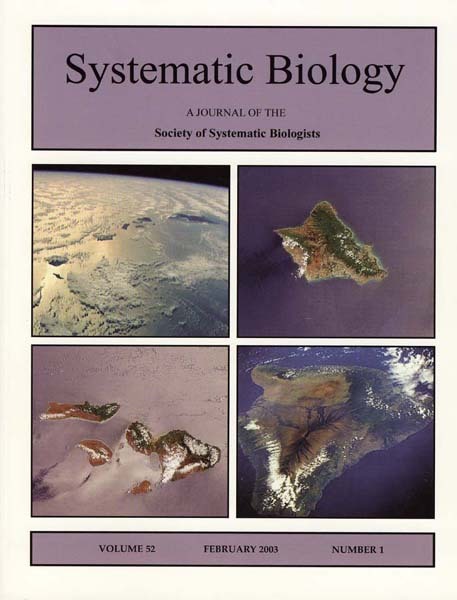 Ultrastructure of the spermatozoa in the spider genus Pimoa – new evidence for the monophyly of Pimoidae plus Linyphiidae (Arachnida: Araneae). American Museum Novitates 3682: 1-17. Dimitrov D., Hormiga G. 2010. Mr.Darwin’s mysterious spider: On the type species of the genus Leucauge White, 1841 (Tetragnathidae, Araneae). ZOOTAXA2396:19–36. Tu, L., and G. Hormiga. 2010. The female genitalic morphology of “micronetine” spiders (Araneae, Linyphiidae). Genetica (DOI 10.1007/s10709-009-9368-9). Benjamin, S., and G. Hormiga. 2009. Phylogenetic placement of the enigmatic genus Labullinyphia Van Helsdingen, 1985, with redescription of Labullinyphia tersa (Simon, 1894) from Sri Lanka (Araneae: Linyphiidae). Contributions to Natural History 12: 161-181. Dimitrov, D., Benjamin, S., and G. Hormiga. 2009. A revised phylogenetic analysis for the genus Clitaetra Simon, 1889 (Araneoidea, Nephilidae) with the first description of the male of the Sri Lankan species Clitaetra thisbe Simon, 1903. Bulletin of the Museum of Comparative Zoology 159(6): 301-323. (doi:10.3099/0027-4100-159.6.301). Arnedo, M.A., G. Hormiga, and N. Scharff. 2009. Higher level phylogenetics of linyphiid spiders (Araneae, Linyphiidae) based on morphological and molecular evidence. Cladistics 25: 231-262. Tu, L., and G. Hormiga. 2009. The female genitalic morphology of “micronetine” spiders (Araneae, Linyphiidae). Genetica (DOI 10.1007/s10709-009-9368-9). Santos, A.J., M. O. Gonzaga, and G. Hormiga. 2009. Notes on two problematic eastern Asian species of the spider genus Oecobius (Araneae: Oecobiidae, Linyphiidae). Journal of Arachnology 37:101-102. Coddington, J.A., I. Agnarsson, J. A. Miller, M. Kuntner and G. Hormiga. 2009. Undersampling bias: the null hypothesis for singleton species in tropical arthropod surveys. Journal of Animal Ecology 78:573–584. Dimitrov D., Hormiga, G. 2009. Revision and cladistic analysis of the orbweaving spider genus Cyrtognatha Keyserling, 1881 (Araneae, Tetragnathidae). Bulletin of the American Museum of Natural History 317:1-140. PDF available via the AMNH research library (very large file). Hormiga, G. 2008 . On the spider genus Weintrauboa (Araneae, Pimoidae), with a description of a new species from China and comments on its phylogenetic relationships. ZOOTAXA 1814: 1-20. Hormiga, G. and L. Tu. 2008. On Putaoa, a new genus of the spider family Pimoidae (Araneae) from southern China, with a cladistic test of its monophyly and phylogenetic placement. ZOOTAXA 1792: 1-21. Kuntner, M., J. Coddington and G. Hormiga. 2008. Phylogeny of extant nephilid orb-weaving spiders (Araneae, Nephilidae): testing morphological and ethological homologies. Cladistics 24: 147-217. Lopardo, L. and G. Hormiga. 2008. Phylogenetic placement of the Tasmanian spider Acrobleps hygrophilus (Araneae, Anapidae) with comments on the evolution of the capture web in Araneoidea. Cladistics 24: 1-33. Dimitrov D., Álvarez-Padilla F., Hormiga G. 2008. Until dirt do us apart: on the unremarkable palp morphology of the spider Sternospina concretipalpis Schmidt& Krause, 1993, with comments on the genus Prionolaema Simon, 1894 (Araneae, Tetragnathidae). ZOOTAXA, 1698: 49-56. Alvarez-Padilla, F. and G. Hormiga. 2008. A protocol for digesting internal soft tissues and mounting spiders for scanning electron microscopy. Journal of Arachnology 35: 538-542. Dimitrov D., Alvarez-Padilla F., Hormiga,G. 2007. The female genitalic morphology of the orb weaving spider genus Agriognatha (Araneae, Tetraganthidae). Journal of Morphology 268(9): 758-770. Hormiga, G., F. Alvarez-Padilla and S.P. Benjamin. 2007. First records of extant Hispaniolan spiders of the families Mysmenidae, Symphytognathidae and Ochyroceratidae (Araneae), including a new species of Ochyrocera. American Museum Novitates 3577: 1-21. Lopardo, L. and G. Hormiga. 2007. On the spider genus Cepheia Simon 1894(Araneae, Synaphridae). American Museum Novitates 3575: 1-18. Ramírez, M.J., J.A. Coddington, W.P. Maddison, P.E. Midford, L. Prendini, J. Miller, C.E. Griswold, G. Hormiga, P. Sierwald, N. Scharff, S.P. Benjamin, and W.C. Wheeler. 2007. Linking of Digital Images to Phylogenetic Data Matrices Using a Morphological Ontology. Systematic Biology, 56 (2): 283-294. Lopardo, L., G. Hormiga and A. Melic. 2007. Spinneret spigot morphology in synaphrid spiders (Araneae, Synaphridae), with comments on the systematics of the family and description of a new species of Synaphris Simon 1894 from Spain.American Museum Novitates, 3556: 1-26. Hormiga, G. 2000a. Higher level phylogenetics of erigonine spiders (Araneae, Linyphiidae, Erigoninae). Smithsonian Contributions to Zoology, 609:1-160. Hormiga, G. 1994a. A revision and cladistic analysis of the spider family Pimoidae (Araneae: Araneoidea). Smithsonian Contributions to Zoology, 549:1-105. Hormiga, G. 1993a. Implications of the phylogeny of Pimoidae for the systematics of linyphiid spiders (Araneae, Araneoidea, Linyphiidae). Memoirs of the Queensland Museum, 33(2):533-542.